Anybody who has eaten out in the last few years will have noticed the popularity of the farm to table movement, which uses produce from local farmers and farmer’s markets. Farmer’s markets place emphasis on thinking about who grows our produce and plants, and has also become a popular weekend activity all over the country (often to the chagrin of partners everywhere!). This new pattern of becoming closer to farmers and growers makes a lot of sense; Farmers always have their eye on what is freshest, in season, and many (like ours) know what will illicit the most incredible response. If you have been to a farmer’s market lately, you are bound to notice that farmer’s markets aren’t just for fruits and veggies anymore. From artisanally prepared foods, to cheeses and coffee roasters, farmer’s markets seem to have it all! But our new favorite at the farmer’s market has to be seasonal flowers and bright, innovative bouquets. Inspired by our enjoyable walks through the market, we now have options to celebrate the freshest flowers and early mornings at the market in our new grower’s choice options, our Farmer’s Market bouquets. What makes a grower’s choice bouquet special is the farmer’s market feel that gives a bouquet less structure with more unique flower choices and combinations. As an extra special touch, these fresh bouquets are exclusive, so no two are alike, meaning you’ll know your loved one is receiving something truly different and inspired. If you are interested in knowing more about how our flowers are grown and shipped, you can learn more here. 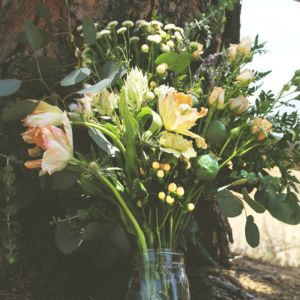 Join our farm to table movement with a grower’s choice bouquet!